The built-in controls have an inheritance hierarchy. The base class is called Control and it contains several common events, properties and methods. RectControl subclasses Control and adds additional events, properties and methods. 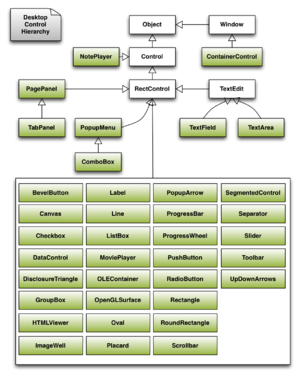 Most desktop controls subclass RectControl, although a few have another subclass in between. Below is a list of some of the common events, properties and methods that are available for UI controls. Control is the base class for all desktop controls. Refer to the Language Reference for details on all its events, properties and methods. Called when the control is closed. Called when the control is opened. Use this to do any control initialization. The handle can be used to interface with OS APIs using the Declare command. The Index is used with Control Sets. The X and Y coordinates of the mouse cursor in points. When a control is on a PagePanel or TabPanel, this value indicates the panel on which it resides. Set to Public or Private. Private controls cannot be accessed outside the Window. Identifies the parent window of the control. Call this method to remove the control from the window. RectControl is a subclass of Control. Most controls that can appear on a Window are subclassed from RectControl. Refer to the Language Reference for details on all its events, properties and methods. This page was last edited on 21 January 2019, at 15:47.